MARSians Crush Around The Bay! 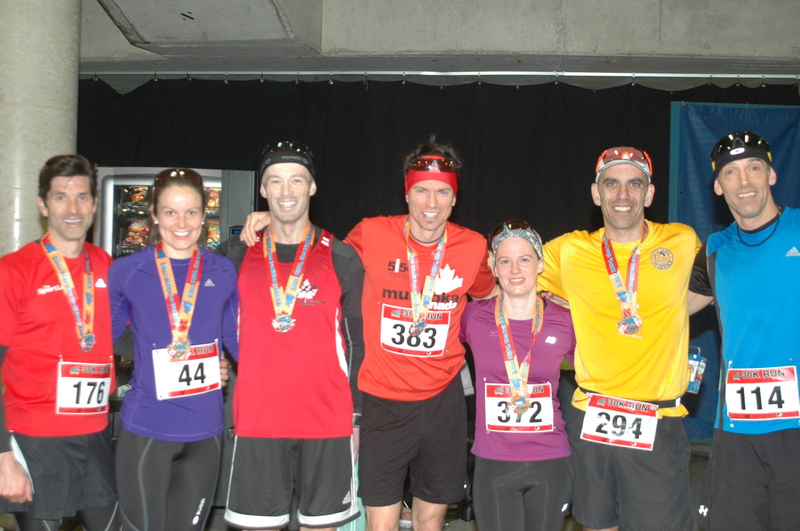 Muskoka Algonquin Runners (MARS) were a force to be reckoned with at the 120th running of the Around The Bay 30K race in Hamilton, Ontario on March 30, 2014. Around the Bay is the oldest road race in North America, older than the Boston Marathon. Leading the way for MARS was Troy Cox, who ran 1:51:39, placing 30th overall and second in his age category. Pierre Mikhail finished with a 2:02:12, 101st overall and 14th in his age group. Mark Sinnige followed shortly after in 2:04:02, 121st overall and 15th in his category. Mark was followed by Roger Penney, in 2:05:47, 144th overall and 18th in his category. The top MARS women were Katherine Ahokas and Jess Sheppard. Katherine ran 2:07:56, was 167th overall, 16th woman and 3rd in her age category. Jess was right behind her in 2:08:01, 168th overall, 17th woman and 4th in her age category. Lowell Greib placed 199th, in 2:09:22, 36th in his age category. Other Huntsville runners competing included Brian Gray, Cheryl Dove, Jane Wolfe, Nicole Howell, and Diane Gagnon. In addition there were 16 racers from Bracebridge competing. Muskoka Algonquin Runners has a busy spring ahead. The club is dedicated to running and runners and welcomes all level of runner. All of our harder workouts happen on loop courses, so you don’t need to be intimidated! Give it a try and we are pretty sure you will like it and be amazed at how quickly you improve. This week’s schedule is altered a little to accomodate the recovering racers and the Calendar tab has been updated to reflect this information. There will be no organized Tuesday run this week, and Thursday’s noon long run is being replaced with a 6:30 am Fartlek on a loop course. Spring is here so plan to join us! Membership information as well as a training calendar can be found at www.muskokaalgonquinrunners.com. Currently, the club meets Tuesday and Saturday mornings for 6:30 am workouts and 12 noon on Thursdays for a long run. In April, MARS will be teaming up with the Huntsville Hurricanes Track and Field Club to offer a 7 week running clinic for children in grades 6,7 and 8 who are interested in training for the 5Km race at Band on The Run June 14 in Huntsville. The Huntsville Hurricanes program will run Wednesday and Sundays. Each Sunday, the kids in this extra program will learn a new aspect of training and will do an age appropriate workout. Visit www.huntsvilletrackclub.ca for track club details, or visit the Contact tab at our website. MARS will also be returning to The Craftsbury Outdoor Center’s High School Cross Country Running Cam this year. Kids entering grade nine or older who are club members are welcome and there are six spots left (12 total traveling and 25 at the camp). The camp setting is in lovely northern Vermont. The Director of Running is the fabulous Lynn Jennings, a three time World Cross Country Champion and Olympic 10,000m Bronze Medalist. The kids depart Huntsville June 28 and return July 5. Contact MARS through the Contact tab at the website for details. For more than 30 years, runners of every level and all ages have come to Craftsbury for expert coaching, camaraderie, healthy food and an unmatched natural environment. Muskoka Algonquin Runners hopes to see you on the roads! This entry was posted in Club Details, Hoyas, Masters Running, Races, Running Story, Scheduled Runs. Bookmark the permalink.